Ian Mosca and Bryan Byng remain in the band today. Along with Freddie, Alan and Bryan toured throughout Europe, Australia, America and The Middle East, sharing the stage with Gerry and The Pacemakers and The Searchers. Alan and Bryan are joined by The Temple Brothers, Steve and Colin who in their own right are seasoned professionals having toured extensively with their Everly Brothers tribute show and Midnight Dynamos rock and roll band. 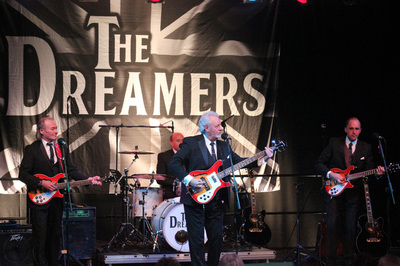 With their unique harmonies and musicianship they add an extra dimension to the Dreamers, who along with the hits of Freddie and The Dreamers perform the most popular songs of the fifties rock and roll days and the great songs of the sixties. Book early to avoid disappointment as tickets are selling really fast, with only a limited amount now available.